When my son was growing up, he loved building things with Legos, a habit I also acquired (when I was allowed to help). 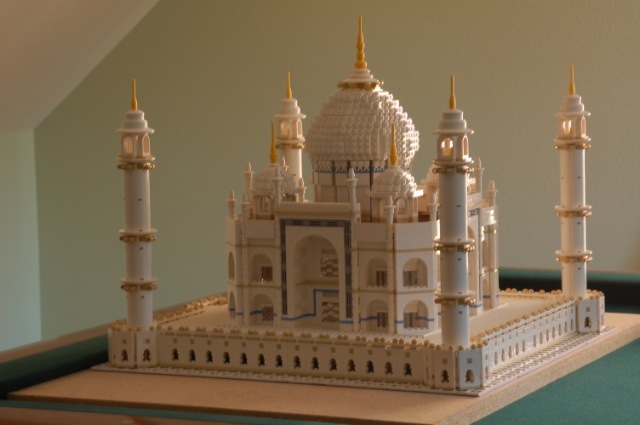 A couple of years ago, I finished my first big Lego project the “Taj Mahal” – all 5900 plus pieces (took me 6 weeks), it was so much fun and I will never take it apart. Then today, I came across the following Lego masterpiece (with thanks to the Register). This may well be the best thing by an Apple engineer this year (sorry iPhone 4 and iPad) This is truly impressive, and as the person in the video states. “Pretty impressive for a bunch of plastic blocks”. I would love to see this as a kit. For more information on the Antikythera Mechanism go here. This entry was posted in science and tagged antikythera, clever, Lego, science by geoff. Bookmark the permalink. Staggering. Building the replica in lego is awesome. Unravelling the complexities is an amazing achievement. ““““““““““““““““““““““““““““““““““““““““““““““““““`spotting the pattern and building the mechanism to predict future eclipses……………………………………………………………….. gob smacking !!!! See here…Hublot have rebuilt the real thing.